© Norman Rockwell Museum. All rights reserved. Stockbridge, MA, March 21 2019— Always believe that a small group of individuals can change the world. Norman Rockwell and America’s illustrators are testament to that. So are the founders of the museum dedicated to American illustration in all of its variety. Fifty years ago, when a handful of citizens in Stockbridge, including Norman and Molly Rockwell, banded together to save the Old Corner House, a 200-year-old building located on the town’s Main Street, few could have predicted the impact of their inspired work. 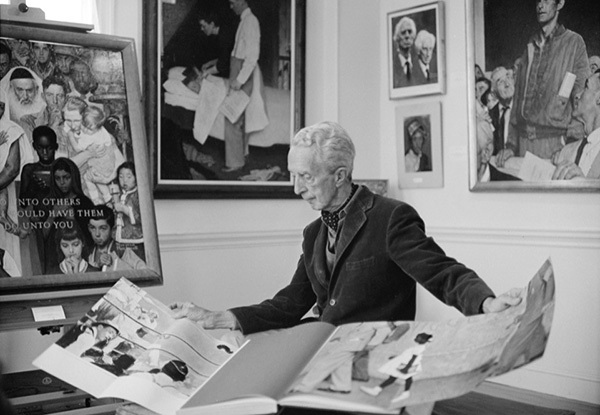 Norman Rockwell’s generosity to place his artwork in trust for art education and appreciation for public enjoyment, formed the core of the museum that was to embrace, celebrate, and educate the world to the importance of illustration, telling America’s visual history. Looking back to 1969, we witnessed a series of momentous events in our world history. Not only did Norman Rockwell Museum open its doors at the Old Corner House, but a caravan of young people were trouping to Bethel, New York, for what became the legendary Woodstock Music Festival, launching a new era of peace and protest, while man completed his journey to land on the moon—a once unimaginable dream. Other significant moments, great and small, were noted in 1969, including the reopening of Stockbridge’s Red Lion Inn by Jane and Jack Fitzpatrick; the formation of Chesterwood, a National Trust Historic Site which once served as the home and studio of sculptor Daniel Chester French; and the half-century mark of a deepening understanding of mental health, made possible through Stockbridge’s prestigious Austen Riggs Center. Throughout 2019, these four landmarks will celebrate some of the nation’s finest moments of artistic creation, historic preservation, community building, and humanity. Stockbridge will be the place to be this summer. Norman Rockwell Museum has exciting exhibitions planned, including: an intimate look at Norman Rockwell and his art, coinciding with the reissue of his autobiography My Adventures as an Illustrator; an in-depth examination of the artist’s deep friendship with pioneering thinker and psychoanalyst Erik Erikson; and an illustrated look at the major events of 1969—from Woodstock to the moon. Also this June: the Museum’s acclaimed traveling exhibition, Enduring Ideas: Rockwell, Roosevelt & The Four Freedoms will open at the Caen Memorial Museum in Normandy, France, to honor the 75th anniversary of D-Day, and look at Norman Rockwell’s influence in relation to this turning point for World War II in Europe. Mark your calendars! We look forward to celebrating a Gala anniversary with you and today’s most distinguished illustrators on June 22. You—our neighbors, friends, and members—make everything possible. You bring joy, laughter, history, and human stories to the world through the celebration of American illustration.